Looking for an excellent instrument for your child, but intimidated by the expenses? Unsure of the qualifications of a good violin? Concerned that you won’t get the biggest bang for your buck, and that a better option will appear after you’ve checked out? This article offers a description of a particular violin, and provides the details behind the features and attributes that it was made with. Hopefully, reading this will inform you about the pros and cons of the equipment, and will give some insight into what to look out for. The Stentor II violin is one whose reputation with teachers is nearly unprecedented by instruments of its tier, whose tone is crisp and brisk, and whose color is brown, organic, and smooth in texture. It is a standard, as far as student violins go, and can work well in the hands of any beginner. Its clear and bright quality and regular surface hue make it suitable in any ensemble, as well as in any solo recital setting. Unfailing in its streamlined accuracy and pristine purity, it provides a student with a correct portrayal of her techniques and depth of artistic expression. The audio and vibrations that this instrument is capable of causing are nearly unparalleled by other mass-produced starter violin outputs of its grade, and the warmth that the tone embodies is full and satisfying, able to leave listeners with no unquenched desires, but, somehow, leaving them thirsty for more. The solid tonewoods that compose the violin are carved to deliver the most-full-bodied and natural sounds one can expect from a student’s retail violin, and are designed to express the most-accurate representation of a player’s emotions, work ethic, and soul, and can invoke upon audience members a sense of truth and justice, and a feeling of perfect honesty. Previously-unheard details can be exposed by the violin, and students and teachers can expect formerly-unperceived harmonies and overtones to reveal themselves from the wood and through the air they travel by. Whether in an acoustically-enclosed room, a hard-surfaced dining area, or an outdoor environment, the violin’s sounds can grant any nearby hearer contentedness and peace, and are bound to release even the darkest, most-withheld sentiments from the heart. The violin’s visual elements are basic, though they stand as archetypal of industry violin aesthetic. The surface of the violin is brown, and can blend well with the string instruments of a traditional orchestra. No maestro or conductor should be irritated by the color, as it conforms perfectly to the standards set by renowned symphonies. Also, the tuning pegs, fingerboard, tailpiece, and chinrest are ebony (or black), giving any owner the right to say, “These are well-colored.” They do not stand out in a crowd of instruments, and should not instill fear into the mind of a player who is first entering a youth orchestra. As a wise man may have once said, “A man’s weapon is the man’s strength.” If the saying holds true, the user of this tool is a frightening foe indeed, as the instrument is awesome, in at least a visual sense. The violin’s top is made of spruce – a common material under the fingers of modern performers – while the musical utility’s back and sides consist of maple wood. Both of the materials are near-ideal for sonic production, and are used by a significant amount of players. All of these components combine to make a great-looking fiddle that will please the eye as much as it pleases the ear. 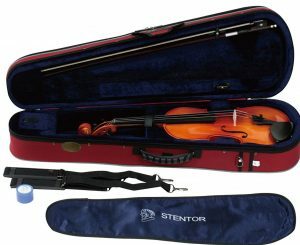 Reviews of the Stentor Student II violin are extremely favorable, as each of them on a certain site gives five stars. People say that the violin is a good starting-instrument, that Stentor has proven to be a reliable violin-making company, and that the instrument is definitely worth its price. Apparently, teachers have used the Student II in demonstrations, and several videos of performance demos have received handfuls of likes. Overall, people say wonderful things about the musical equipment, and a statement against it is yet to be found by this writer. While many violins come with an array of items necessary to any violinist, the Stentor Student II is accompanied by only a few objects. A lightweight case is a primary proponent of the package, and it includes a pocket (for rosin, a cloth, and so forth), a space for the violin (of course), a Velcro strap to hold the violin in place, two holders for bows, and a protectant blanket. The case is zipper-bound, and has straps and a handle that make it super-portable. A bow is also a part of the combo, and is made from hand-carved wood. Aerodynamic and straight, it is appropriate for any beginning violinist. 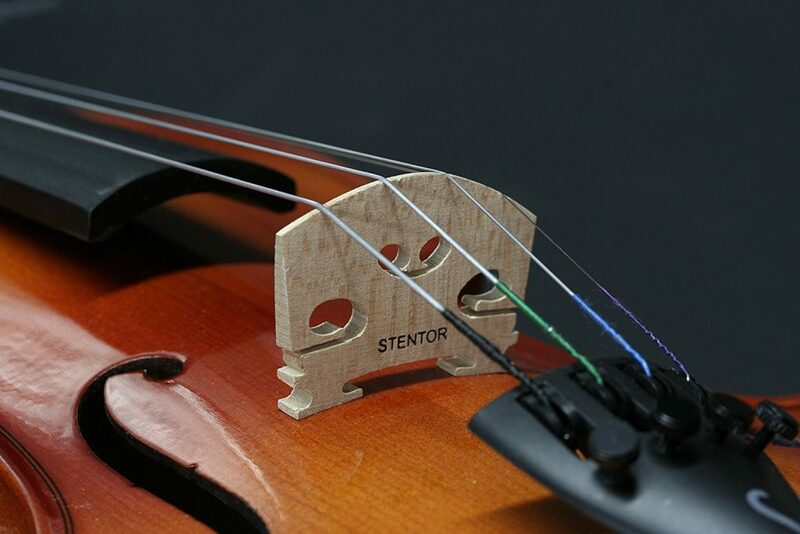 Stentor is the leading seller of violins worldwide. Its instruments are well-regarded, as they rarely receive a poor review. The Stentor Student II violin is much like its relatives in that it is nicely-made, delicately-designed, and fine-tuned for beginner compatibility. It is the best violin for young students and adult hobbyists alike. It makes for a cute birthday gift, a sweet kindergarten-graduation present, and a neat thing to have around the house. It is meant for beginners, the group of which does not exclude teenagers or middle-aged people; anyone can learn with the instrument, and everyone who tries is bound to have an enjoyable experience. Teachers and students will be encouraged by the soft yet well-rounded tones that it offers. For an outfit price of about $200, the Stentor Student II violin can be purchased at small cost. Many violins of lesser quality go for about the same amount. Overall, the Stentor Student II violin is a great instrument for its price, and is likely to agree with mentors and learners alike.